According to Health Ministry data, the country has less than a third of the trained psychiatrists it requires. Even as vaunted claims of India’s demographic dividend hit the headlines, there’s a looming mental health crisis that’s still not getting the kind of attention it deserves. As a study by the World Health Organisation points out, over five crore Indians suffered from depression in 2015, while an additional three crore suffered from anxiety disorders. For a country that, in 2012, recorded the highest estimated number of suicides, these staggering numbers pose a major health crisis in the offing. Yet, recent replies of the Ministry of Health and Family Welfare to questions raised in the Lok Sabha reveal just how ill-equipped India is to deal with this crisis, thanks to a massive shortage of mental health professionals in the country. In March of this year, for instance, the Ministry told the Lok Sabha that the numbers of psychiatrists, clinical psychologists, and psychiatric nurses and social workers fell far short of the requirement in the country. Drawing on 15-year-old data from the National Survey of Mental Health Resources carried out in 2002, the reply stated that India had just 3,827 psychiatrists and 898 clinical psychologists as against a requirement of 13,500 and 20,250 respectively. That comes out to the availability of just over 28% of the required number of psychiatrists, and just 4.4% of the required number of clinical psychologists in the country. Dr Sandip Deshpande, Consulting Psychiatrist at the People Tree Maarga in Bengaluru, says this persistent shortage of trained mental healthcare professionals in the country is the result of a lack of focus at the institutional and administrative level. “There is no separate exam for psychiatry at the MBBS level, unlike fields like orthopaedics or paediatrics. So, students don’t take psychiatry seriously. The problem begins from there,” Sandip points out. “There is also very little emphasis given to training in mental health issues at this level,” he adds. And it isn’t just a shortage of diagnostic and treatment facilities that’s the problem, says Sandip. What’s missing a holistic environment for mental well-being. “Mental healthcare is not just about diagnosis and treatment. There is also a need to train students in communication, negotiation and conflict resolution. These are things psychiatrists can train students in, but unfortunately, there is no allowance for that,” he explains. An earlier reply by the Ministry of Health and Family Welfare, shows that the problem is particularly acute in the public sector, where the numbers of mental health professionals falls drastically short across various states in the country. 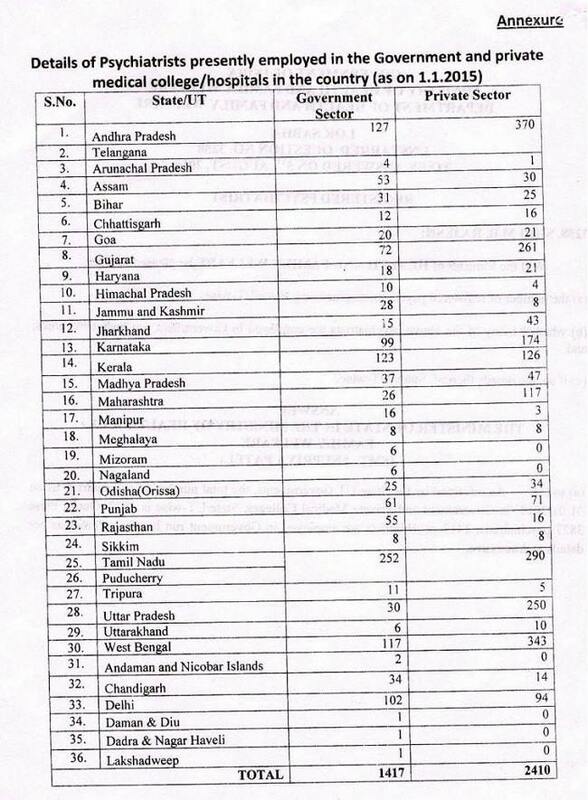 According to this data, just four states – Delhi, West Bengal, Tamil Nadu (including the Union Territory of Puducherry) and Kerala – record more than 100 psychiatrists in the public sector. Of these, TN stands a faraway first with over 250 psychiatrists in the public sector. Some of the country’s most populous states like Bihar, Uttar Pradesh and Madhya Pradesh have just 31, 30 and 37 psychiatrists in the public sector respectively. While persons may feel less stigma about approaching private sector professionals rather than government hospitals for mental health concerns, says Sandip, the low numbers of psychiatrists in the public sector poses a significant concern for persons from lower income backgrounds. One of the major difficulties, says Sandip, is that mental healthcare professionals cannot drastically cut down on the time required for each patient, and this sets definite limits on what each professional can do. “In psychiatry, we cannot do a two-minute consultation. Access to mental healthcare has to improve across the board. Not just in private but in the government sector also,” he says. All of this, says Sandip, reveals the significant distance between a robust mental healthcare machinery and the current situation. “We have the Mental Healthcare Bill this year. It is now that the government is waking up to the need for mental healthcare,” he says, adding, however, that drastic shortages in mental healthcare professionals cannot be fixed overnight. One major shift that should occur in the near future is a greater emphasis on common mental health issues at the primary care level, he adds. “Common mental illnesses can be dealt with at a general practitioner level also in order to reduce burden on government institutions like NIMHANS. Again, this can be done by giving due emphasis to psychiatry at the MBBS level as well as by training general practitioners to recognise and treat common mental illnesses at their level,” he says.